We have friends who share our love for German Shepherds and having a spectacular male, decided to raise a few litters of pups. They aren’t breeders, just wanted to ensure the line would continue. Before our oldest dog died, she brought a pup to our house and it aggravated both of our dogs to the point of snarling and tempers, so we let her take it back with her. But on the day after Christmas this year, she called to say the last litter had been hard on her female and she wasn’t going to have anymore pups. There was one left, the last pup from the last litter. Did we want to look at her? At thirteen my old girl isn’t running around much – except for chasing the cat which we try to prevent by only letting them out when the other is up. She initially curled her lip, as though she might snarl, and then walked off. Suffice it to say, the lack of protest by them has resulted in another family member. Her name is Gretel. She is cuddly, smart, and really active. She is also just a baby, so she plays hard then sleeps, howls in the middle of the night, hasn’t learned proper bathroom techniques yet, and has the sharpest little teeth and claws you’ve ever seen. We forgot about that part. It’s been a long time since we’ve had a puppy. But her little face and huge paws make her adorable. We are already smitten. She fell asleep in my husband’s arms last night, after running around the basement like a banshee, chasing a ball and then her tail. He loved her little head draped over his arm, the easy breathing of her restful sleep – something we’re not getting much of. We’re up early and in bed late, tending her needs. Just like a baby! Oh, she IS adorable!! At least your readers will get to enjoy the cute pictures of her….without the sleepless nights, bathroom issues, sharp teeth, etc.! Looking forward to more pictures of Gretel! Thank you Dianna. Right now she’s so rambunctious it’s difficult to get good pictures of her. Soon maybe. Awww…a Christmas baby. You will always remember she was born around this time of year. I know you will enjoy her. Yes, that’s a bonus isn’t it! Thanks Melynda! Golden retriever and St. Bernard – you’ve got your hands full. But aren’t they just delightful! Wish I could take credit for that, but sadly cannot. Thanks John. Congrats, Mom (and Dad)! The only dog I ever had was a German Shepherd. We got him right after my first husband died to take care of the kids and me and he did a(n) (over-)good job. I won’t have another dog, but my son has and does, as does my daughter’s husband and we loved him over the years (the dog that is … the husband is growing on us 🙂 ). German Shepherds are very protective of their humans. And I’m planning on teaching this one to like the cat. Keep your fingers crossed for that. Awww …. any day with a new pup in the house is a darn good day. Gretel is beautiful and I’m looking forward to reading of her adventures with you in her new fur-ever family! ‘Fur-ever family’ – how clever – I love that. I’ve only had a puppy once and it was about 30 years ago. The amount of work and the lack of sleep is too much for me now. We got Harry when he was about 18 months and Honey when she was about 5. Zoe our latest addition is about a year old. When we lost Honey in early December I started wanting another dog. We got Jake who is about 3. Harry and Zoe are big dogs. Jake is tiny. Unfortunately, neither of my big dogs like him very much. He’s a lovely 10 pound guy, but we are gifting him to some very good friends who fell in love wit him too. Jake will have a wonderful home and be cared for and not go back to the Shelter where we found him. 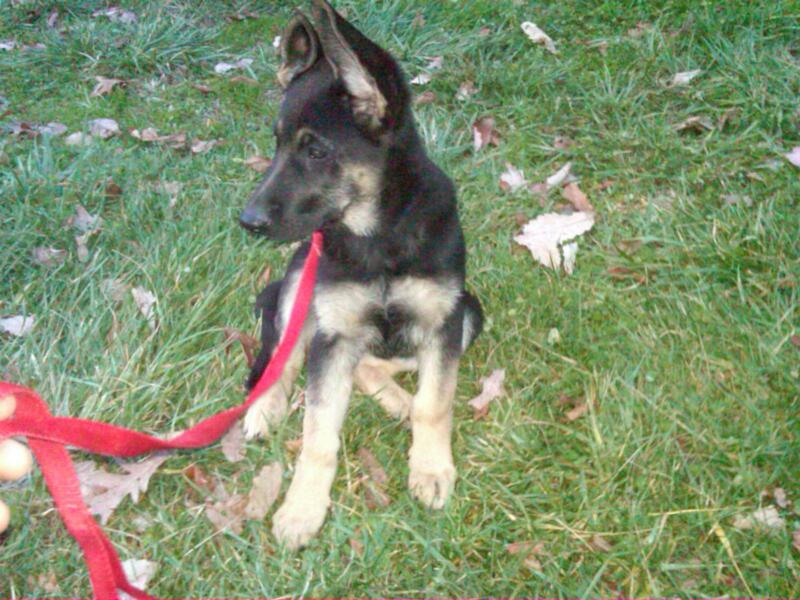 I adore German Shepherds. Your girl is gorgeous! I had a wonderful male named Willie and he was my best friend. I love those big paws! Those big paws look so funny when she’s running around like a colt. And the ears….oh my! I remember reading about Honey. Losing a pet is devastating. The last one like to have killed me. Literally. For days I couldn’t breathe and my heart raced. I found out it was anxiety attacks after thinking I was having heart attacks. I just get so attached to my beloved animals. How delightful……..so cute! And a perfect name too. I will look forward to more glimpses of this new treasure. Thank you Bella. At some point my husband wants a male – we’ve always had females. So the plan is to name him Hansel and the two will sound cute together. Beautiful girl! I’m sure she’ll grow to have a great sense of humor as well — all the shepherds I’ve known did! Congrats! And tons of personality. Gretel is already cocking her head to one side and listening intently to my voice. Thanks. She is already giving the older dog a workout! Probably the best thing we could have done for her, though she would never admit it. Thanks Bella. Beautiful puppy! Now your love for Choco is going to share with this new member. I hope, she is not afraid of Choco. 🙂 All of us know, how much you care about these souls who are covered with animal skins. She is lucky for sure to be part of your family. ‘souls covered with animal skins’ – perfect. I haven’t introduced Choco to her yet, but we’ll see. He’s getting a little jealous over me and I don’t want the pup to risk getting kicked. Thanks for saying she’s lucky. I hope she feels that way. Thank you. A ‘handful’ is definitely putting it mildly. But oh the love….! How sweet! She won’t be a baby for long, so enjoy this time! I know, and I’m trying. She’s got energy I would die for, and then just collapses into sleep – preferably in our arms. What a baby! Renee one more award to your blog, this time “Candle Lighter Award”. Congrats!! Every time I think of sheep now, I recall the guardian dogs that we encountered in Montana with the sheep in the Rockies. Wow! They’re tough! Happy New Year! What a gorgeous girl! I’ve been thinking I’d like to have a second dog, but still remember the work and the adjustment in my life when I brought my current pooch home with me. Your post helps me remember the joys and the effort involved! Oh boy! It is definitely a committment. But then she’ll be taking care of us, so the benefits are tremendous, not to mention the joy of a puppy’s love. Thank you for dropping by at Driftwood Ramblings. As an ardent GSD owner (we’ve had four in total, 3 girls and a boy) I thought we’d always just stick with them, but we’ve subsequently branched out and now have four rescue dogs in addition to Toby, our newest GSD, and Bonny, who is 10 years old and the most placid and gentle natured of all is female number three. Toby is 21 months old and a superb dog. Beautiful, gentle and loving as well as highly intelligent and obedient, apart from when he’s decided he really DOES need to bark! Your new baby looks adorable! I know exactly what yoy’re going through as we got three of our rescues as puppies in 2010. The oldest is 1 year, next 11 months and the baby is 9 months. It has been lots of work and we have oly just got to the stage where we can leave all six at home alone for a couple of hours. Prior to this they were never left alone! We are fortunate in that they have all become good friends and mostly get on very well together. I look forward to following Gretel’s progress. You can meet mine by scrolling through my archives.